This is Zechariah 12:3 playing out. It is deception and it is leading up to the fulfillment of the seven-year peace agreement. Maybe this round, maybe not, but it will be signed, you have God’s word on it. 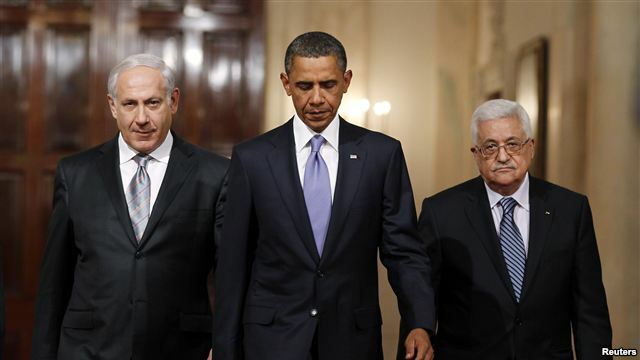 Now that he has secured his second term, President Barack Obama has already secretly pledged to the Palestinians he will press Israel into a new round of so-called land-for-peace negotiations, a top Palestinian Authority negotiator told KleinOnline. The negotiator said top members of the Obama administration told the Palestinians the U.S. president will renew talks aimed at creating a Palestinian state in the so-called 1967 borders—meaning in the West Bank, Gaza Strip and, notably, eastern Jerusalem. The negotiator further revealed when it comes to dividing Jerusalem, Obama wants to rehash what is known as the Clinton parameters. That formula, pushed by Bill Clinton during the Camp David talks in 2000, called for Jewish areas of Jerusalem to remain Israeli while the Palestinians will get sovereignty over neighborhoods that are largely Arab. KleinOnline previously reported how Palestinians are building illegally in Jewish-owned areas of Jerusalem, changing facts on the ground and resulting in Arab majorities on certain neighborhoods. This is not the first time the Palestinians are claiming Obama will push for new talks during a second term. Just before November’s presidential election, a senior PA negotiator claimed to KleinOnline if Obama secures another four years in office, he will use his second term to target Israeli Prime Minister Benjamin Netanyahu as the main party to blame for the collapse of Mideast peace talks. The negotiator further said Obama had promised the PA that the establishment of a Palestinian state will be one of the main priorities for a second term. The Obama administration today argued in court that the government can make a requirement that violates religious beliefs and that a company cannot reflect the religious faith of its owners. The administration’s statements came in a court filing that asserts the federal government has the authority to order private companies to provide abortifacients for their employees. A case against the order was brought by the Thomas More Law Center on behalf of Legatus, the nation’s largest organization of top Catholic business leaders, and Weingartz Supply and its owner. The federal attorneys – Stuart F. Delery, Barbara L. McQaude, Sheila M. Lieber, Michelle Bennett and Ethan P. Davis – are arguing in federal court in Michigan against a request for a preliminary injunction that would prevent the enforcement of an Obamacare mandate requiring employers to provide such abortifacients through health programs for employees. The plaintiffs argue that the federal order conflicts with the U.S. Constitution by requiring them to violate their religious faith. Israeli Prime Minister Benjamin Netanyahu and U.S. Ambassador to Israel Dan Shapiro allegedly argued over the Obama’s administration’s Iran policy. Rep. Mike Rogers, the Michigan Republican who chairs the House Intelligence Committee, says that his much-discussed meeting with Israeli Prime Minister Benjamin Netanyahu in Jerusalem late last month did, in fact, devolve into an sharp confrontation between Netanyahu and the American ambassador to Israel, the former National Security Council official (and former Obama campaign Jewish liaison), Dan Shapiro.